This article presents the results from the first quantitative readability study of plain language court forms in the United States. Sixty citizens on a jury panel were selected to respond to brief questionnaires that tested relative comprehension of plain language court forms and the corresponding traditional court forms. Results show a marked and statistically significant improvement in reader comprehension when court forms are treated for plain language. The data also suggest that because users of plain language forms understand more clearly what they have to do, when they have to do it, and where to seek support if they need it, there may be significant economies for the court. Researchers in Communications and Public Opinion report this extraordinary finding: language, design and format of text can be manipulated to influence user response. Logically, this body of knowledge should be transferable to legal texts. But, plain legal language is a nascent discipline and academic research in the area of readability of plain language legal forms and instructions is thin. A review of the research literature indicates that, to date, there has been no quantitative research of the readability of plain language court forms and instructions. These forms were studied because treated and untreated versions of each form were readily available, and both are short and lend themselves to a fairly quick field test. Gender: Participants were 47% male; 53% female, closely approximating county and state populations. Transcend administered two 10-question tests to two distinct groups of 30 respondents in a private room at the main courthouse in Sacramento, California. Each group of 30 responded to questions on one untreated and one treated (plain language) court form. Group 1 was tested on Proof of Personal Service, untreated, then Subpoena Duces Tecum, treated. Group 2 was tested on Proof of Personal Service, treated, then Subpoena Duces Tecum, untreated. Questions were read aloud twice by the test administrator. The participants were allowed exactly 20 seconds to write their answers on a blank answer form, and then they moved on to the next question. Respondents were asked not to speak during the test administration. At the completion of each form, the answer forms were collected, and this procedure was repeated for the second form. For control purposes, the first group of 30 participants responded first to questions about the untreated form. The second group was tested on the plain language form first. The questions were designed to elicit participants’ understanding of the purpose of the form and the specific steps each form required. The test administrators ran a practice test on practice subjects to ensure that the instructions and questions were clear and the timing was well-paced. 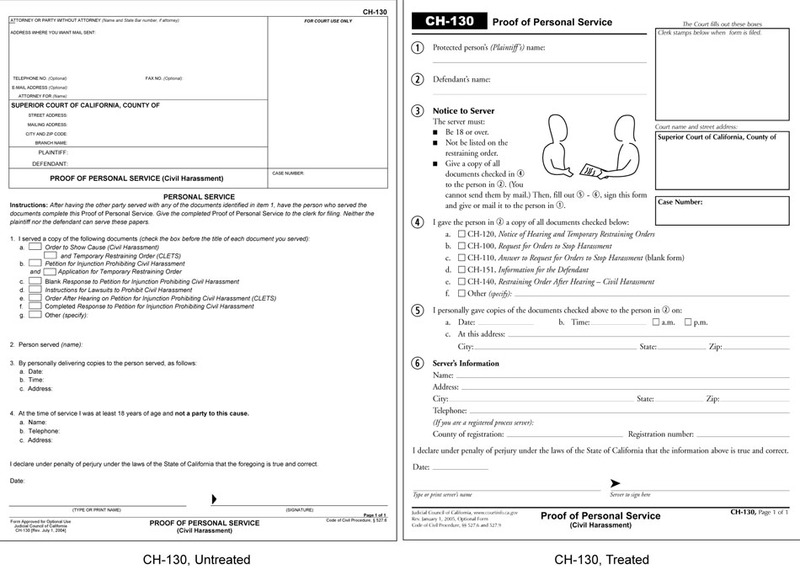 When asked, “What do you think this document is for?” only 23% of the respondents on the untreated Proof of Service, Form CH-130 form were able to respond correctly. In contrast, 70% of the respondents understood the purpose of the treated form. 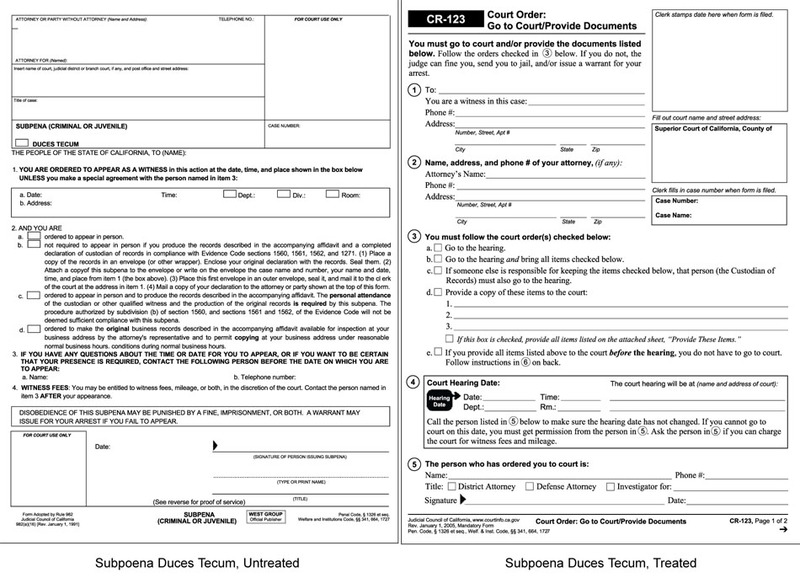 When asked, “What does this form tell you to do, exactly?” 90% of the participants responded correctly on the treated version of the Subpoena Duces Tecum, but only 60% did so on the untreated form. Again, this is significant at the 99% level. To further explore the qualitative aspects of the results of the readability of court forms, we also conducted exit interviews with a subset of 10 members of each group. During these interviews, most participants indicated that if given a court form that they did not understand, they would not know where to turn for support. With 77% percent of respondents unable to identify what the Proof of Service form was for, we can anticipate a low level of compliance with the general directive or specific instructions on this form. The last question on each test asked participants to rate on a scale of 1 – 10, how easy or hard it was to read each of the forms. Respondents’ subjective assessment of the overall readability of the forms was also heavily weighted to the plain language forms beyond a 99% confidence level (z = 2.77; p = .0027, one-tailed). In other words, we can say with certainty that the Judicial Council’s new plain language forms are easier for consumers to read and understand. While average consumers and new users are likely to find the plain language forms easier to read and understand, legal professionals in California who are familiar with the “old” forms are not. This is because prior familiarity with the subject matter, format, and organization of the text contributes greatly to readability. So, just as credit cardholders know where to look for the key information on their monthly statement, and students can quickly find that hidden little spot on their report cards where their GPA is listed, legal professionals who could easily navigate the style and language of untreated forms may be perplexed by claims that Plain Language forms are more readable because they can no longer navigate them intuitively. The name of the form is no longer in the middle of the document. The form name may be completely new (e.g., Subpoena Duces Tecum is now called Order to Go to Court and Provide Documents). Noun-heavy prompts are replaced by phrases that use direct address and occasional verbs. The old “look” of the caption, 9 point Arial type, heavy use of boxes and ALL CAPS are also gone. In short, the Plain Language forms would be “new”, to this subgroup and they will find these forms more difficult to navigate initially. But, unlike many other users of these forms, this subgroup consists of highly skilled readers and they will quickly get used to the basic formulas now applied to all new Plain Language court form templates. In treating the forms studied here for plain language, it was the intention of California’s Administrative Office of the Court to create forms and instructions that would be more easily understood by a larger number of people, thereby affording increased access to legal information and protections. In fact, the increased readability demonstrated in this study provides strong evidence to support this approach. Plain language court forms treated with the Transcend Readability Index (TRI) are easier to read and more completely understood than untreated versions. There is a statistically significant difference in readability and reading interest as measured by the readers’ perception of the level of difficulty of the forms. We know enough to say that plain language court forms and instructions are better understood, easier to use, and more economical. Future studies would do well to evaluate the relationships between plain language and specific goals, such as rates of Failures to Appear, collections, and compliance to court orders. Tourangeau, R., Mick P. Couper, and F Conrad. “Spacing, Position, and Order - Interpretive Heuristics for Visual Features of Survey Questions.” Public Opinion Quarterly, 68 (3): 368-393. 2004. DuBay, W. H., “Principles of Readability.” National Adult Literacy Database, (www.nald.ca) 2004. This publication contains an overview of foundational readability research and instruments. Statisticians agree that the population size used in this study is a sufficiently large sample size to make generalizations. For Proof of Service – Civil Harassment, CH-130, the average score was 81% for treated and 61% for untreated, significant beyond the 99% confidence level (z = 4.01, p = .0003, one-tailed). For the Subpoena Duces Tecum, the average score was 77% for the treated plain language form, compared to a 66% average of the untreated form, achieving a 95% confidence level (z = 1.94; p = .027, one-tailed), showing superior understanding and comprehension of the document by the treated group. In other words, there exists a very high probability that any court form adhering to these readability guidelines will see similar levels of improvement. A 1993 National Adult Literacy Study conducted by the National Center for Educational Statistics found that when texts exceed the reading ability of readers, they usually stop reading. DuBay, W. H., “Principles of Readability, Readability and Reader Persistence”, pp 30, National Adult Literacy Database, (www.nald.ca) 2004. Professor Richard Wydick, Plain English for Lawyers, reports, “understandable government forms require less staff time to explain and reduce the number of errors by those who fill them out.” Professor Wydick refers to the Australian research by Gordon Mills and Mark Duckworth, The Gains from Clarity (1966) (costbenefit study of plain language documents). The Administrative Office of the Courts experienced a 43% reduction in translation fees (which are billed on a per word basis) when they transitioned the Domestic Violence forms to plain language. For more information on Readability and Plain Language call Transcend at 530.756.5834.